When the enamel (ie. 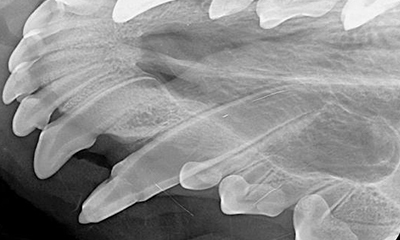 outer layer of a tooth) fails to develop properly, your pet’s teeth may be at risk for infection or fracture. This condition is known as enamel hypoplasia. Teeth will appear rough, pitted and stained yellow. 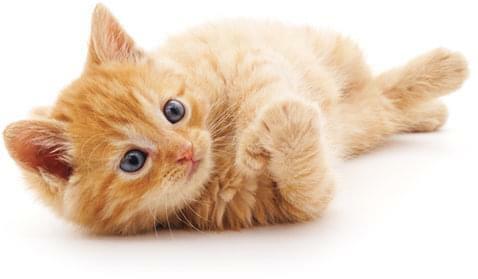 Your pet may experience heightened sensitivity. Teeth will be more prone to tartar accumulation, gum disease, infection and may have abnormal root development. Enamel defects on a tooth. Composite restorative therapy to seal and protect the tooth. Depending on the severity of the enamel defect and the functional importance of the affected tooth, extraction or crown placement are possible treatments. Dental X-ray revealing the thin enamel wall of the tooth. 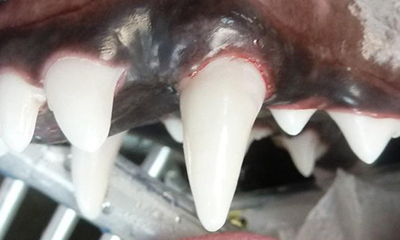 Schedule an appointment today to have your pet evaluated for enamel defects. Enamel hypoplasia refers to a condition in which the outer layer of the tooth (enamel) fails to develop properly. These teeth will appear rough, pitted and stained yellow. These pets can have sensitivity, are more prone to tartar accumulation, gum disease, infection and may have abnormal root development. 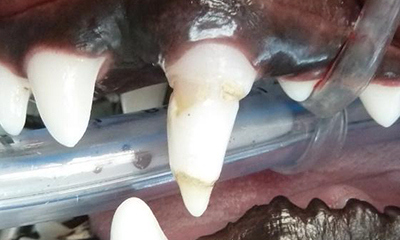 These pets need dental X-rays, tooth debridement and either: sealant, composite restoration, extraction or crown placement. The treatment decisions are based on the severity of the enamel defect, the functional importance of the tooth, and your pet’s lifestyle.